A 3X long Hook designed for Nymphs and Streamers utilizing the TMC perfect bend to produce a classic design. 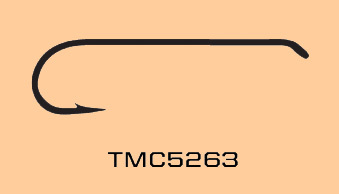 The Tiemco 5263 uses 2X-heavy wire for added strength. This design is the most popular hook for leeches, buggers, or smaller streamers. With the 2x long hook shank you get the appropriate length for imitating leeches and is perfect for bugger patterns.